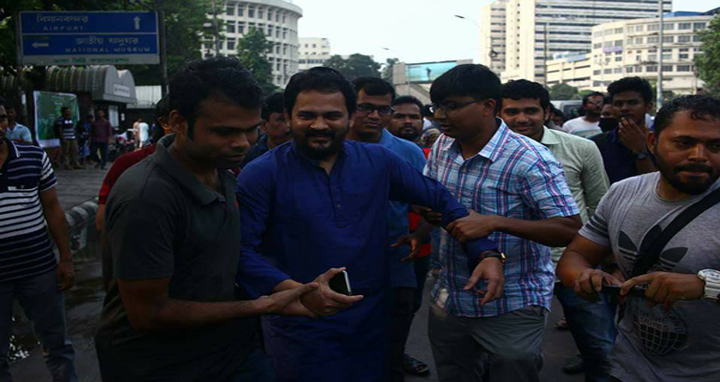 Dhaka, 6 June, Abnews: A team of plain-clothes officials of Detective Branch has picked up Gonojagoron Mancha Spokesperson Imran H Sarkar from Shahbagh intersection area in the capital. Sarker was picked up while he was attending a programme in Shahbagh Square at about 4:30pm on Wednesday, confirmed RAB's legal and media wing director Commander Mufti Mahmud Khan. Earlier on 26 October 2017, a Dhaka court issued an arrest warrant against Imran on charge of skipping a hearing in a defamation suit filed for making derogatory remarks about prime minister Sheikh Hasina. He, however, got the bail in the case in November last.